Hellbound Media are proud to be launching a new comic with a twist. “Dorian & Drama: Reflections of the Damned” is a magazine-style photo comic, telling its story through stunning photographs, gruesome special effects and astounding technical effects. The comic launches tomorrow at Wales Comic Con in Wrexham, and many of the cast and crew will be there. The brainchild of Hellbound Media Editor Matt Warner, “Dorian & Drama” follows the talented stage magician Dorian D’Arcane, played by Nathan Head (Legacy of Thorn, Theatre of Fear, The Zombie King), and his assistant Drama, played by Victoria Mua (who also provided many of the make-up and effects) as they investigate supernatural horrors lurking in an mysterious, old building. You can also pick up a copy at Wigan Comic Con the following weekend. And Hellbound Media have a range of new dates for the new year that we will announce soon. Hope to see you in Wales tomorrow! It’s been a while since we updated as we’ve had a run of excellent cons, and met many amazing people. We’ve started collecting images of our favourite Cosplays at cons, mostly horror/fantasy-related in some way, but sometimes ones that we just know and love! Our collection can be found on our Facebook page so please Like us if you have not already! As well as an amazing run of cons, we’ve had two exciting new releases. 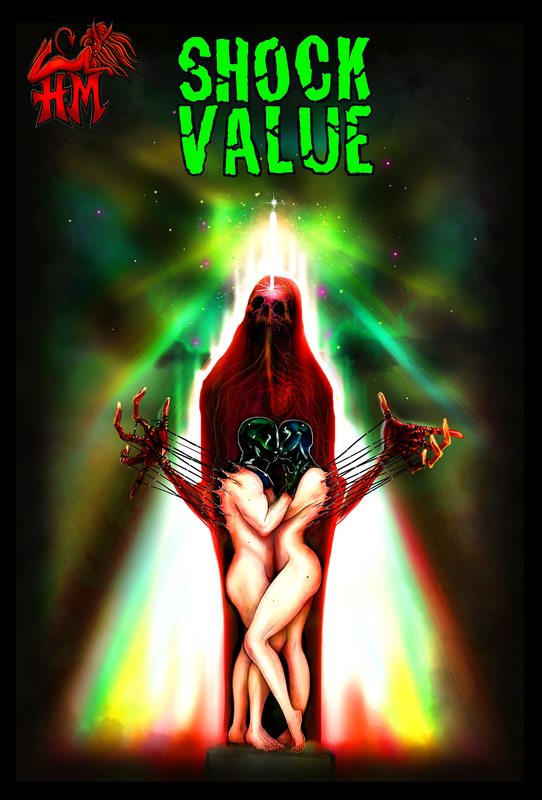 Previously mentioned, we have our third horrific anthology, Shock Value Green. And for those who like grindhouse gore in their horror, we have “Slaughterhouse Farm #2”. But that’s not all, we have some amazing upcoming titles in progress, including something old and something new. “Kiss Me Deadly” is getting re-released in a prestige trade format early next year, and following that we will see the return of the ever-popular Mandy the Monster Hunter in her very own anthology, “The Mandy Book of Monsters”. Also, we want to say a big hello to anyone finding us from “My Geek Box”, where we feature this month in an interview, as a top pick of the month and with a Mandy and Dawn Keenan pin-up poster by the brilliant Gordon Napier. We hope you’ll check out our titles, and perhaps we’ll see you at a future con. Thanks again to everyone who has supported us so far, and we’ll be posting again soon with more information, lists of future cons and reviews of our other favourite small press titles.